There is now a widespread interest in reuse in many domains, from opera houses built over old warehouses, to vintage clothes and everyday goods incorporating repurposed materials or parts. Despite its ubiquity, this extensive creative work is typically seen in narrowly environmental terms, as a means of reducing carbon, resource use or waste. 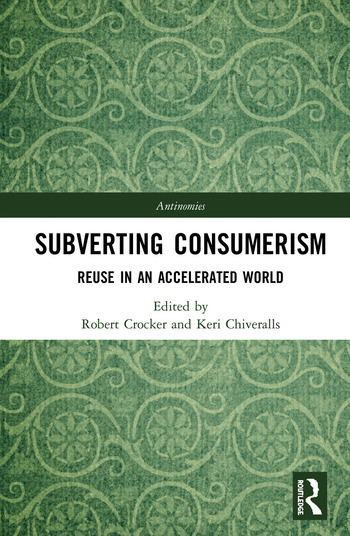 However, as this volume shows, reuse also has aesthetic and cultural dimensions and a rich social currency, invoked to consciously subvert the accelerated consumer culture responsible for our unfolding environmental crisis. In three parts, the essays in this book consider reuse in terms of values, aesthetics and meaning, its application in contemporary urban and spatial settings, and the revival of social practices involving a more conscious recourse to reuse and repair. These are bookended by the editors' essays: the first, on the significant relationship between reuse and technological and social acceleration evident in the surrounding consumer society; and the last, on the multiple forms of reuse deployed in a contemporary alternative building practice, and their contributions to presenting alternative ways of living in the world. Challenging dominant understandings of ‘waste’ and ‘consumption’, Subverting Consumerism shows how reuse has become a means for many to creatively engage with the past, and to discover a continuity and sense of place eroded by the accelerative regimes of contemporary consumerism. Becoming a means of resistance, and offering a range of aesthetic, social and economic possibilities, reuse can be found to subvert and challenge the obsessive quest for the new found in contemporary consumerism. Robert Crocker (DPhil.) teaches the history and theory of design and design for sustainability in the School of Art, Architecture and Design at the University of South Australia, where he is Deputy Director of the China Australia Centre for Sustainable Urban Development. His research is focused on consumption and its contributing role in our environmental crisis. His most recent book is Somebody Else’s Problem: Consumerism, Sustainability and Design (Greenleaf / Routledge 2016). Keri Chiveralls (PhD.) is the Discipline Lead and Head of Program for the first full degree course offered in Permaculture at CQUniversity. Her research interests are in cultural and environmental anthropology, social movement studies and theories of social change. She received her doctorate in Anthropology/Social Inquiry at the University of Adelaide in 2008. Since then she has published book chapters, journal articles and presented at national and international conferences.